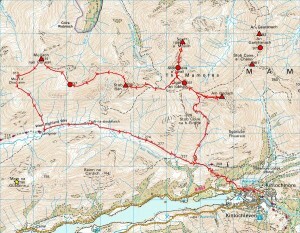 Hadn’t expected to be heading down the road this weekend, but Ian Beattie’s midweek proposal for a Friday night run from Milngavie to Balmaha was just what I needed three weeks before the West Highland Way Race (did the same with John Kynaston, Joe Sheridan and others at the same stage in 2007) so I arranged to stay Friday and Saturday nights with my parents in Cardross, pencilled in a hill run for the return journey on Sunday and set off after school on Friday. But who wants to hear about my brain farts anyway? (Yeah, everybody, I know!) 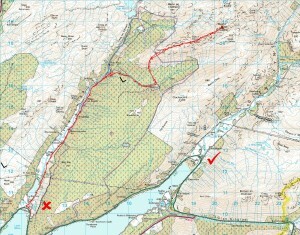 So let’s get back to the real story and tell you that it was a grand night for running (being pleasantly cool and not terribly dark), although I’ll be checking all the signs and markers from Milngavie to Mugdock carefully on 19 June with this starting section of the WHW maybe being the easiest to lose and not all of us programmed to make Ian’s almost convulsive autopilot lurches (born of knowing the course back to front) onto the right path at every junction. And there’s not a great deal more to say here about the run to Balmaha except that I was hoping for a bit of a burn up Conic Hill, took Phil’s invitation for Richie and me to press on through Garadhban Forest literally, found myself oddly committed when it quickly became apparent that Richie hadn’t gone with me, tore up Conic (running all the way for no better or worse reasons than because I could and felt like it) at between 5 and 6 mph and arrived at Balmaha with plenty of time to feel stupid about not being able to get into my van. Some 25 minutes later, just as I was thinking it was time to send out a search party (aka running back to meet the others), Richie arrived with the news that Phil was sharing Ian’s torchlight over Conic, then the less illuminated (?) arrived about 15 minutes later again. At which point Richie offered to take us back to Milngavie, Stan went out of his way to return me to Balmaha and I just wished I’d taken Richie up on the key-fetching fartlek session I’d rejected through fear of being casually burned off! Think yesterday (despite being hot with only intermittent cloud cover) was probably the right choice for a meaty hill run because it’s been absolutely bucketing so far this morning! 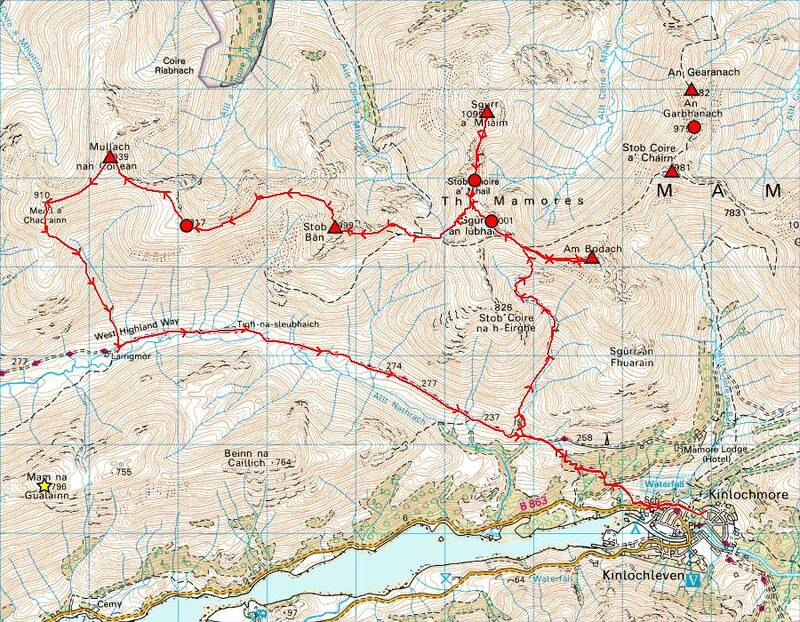 Now, this one was planned as something of a ‘mopping up’ exercise having previously been up Beinn Eunaich but not Beinn a’ Chochuill, and still missing three peripheral tops of Cruachan (Sron an Isean to the east and the ‘Taynuilt peak’ Stob Dearg and Meall Cuanail to the west) that suggested a full traverse as the only tidy way to pick them up. 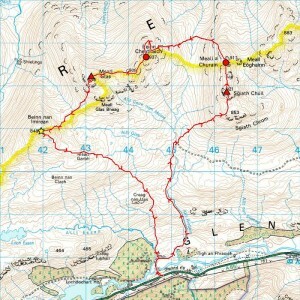 So I hit on the idea of this greater traverse taking in Beinn Eunaich (first time since November 1982! ), Beinn a’ Chochuill and the seven tops of Cruachan, with the fine Corbett of Beinn a’ Bhuiridh thrown in as the most aesthetic route back to my starting point on the Stronmilchan road. But that’s a fair way at 19.2 miles with c.10,000 ft of ascent, giving a run that’s shorter on the ground but as strenuous and time-consuming as a serious trail run of twice the mileage. And, if you ask me why I didn’t leave the road for this hefty round until 2:50pm, I can only answer that 1. I was waiting for the post (usually about lunchtime here) in the hope of getting my Nathan Elite 2V Plus (which did indeed arrive) to try, and 2. this is typically me (afternoon and evening runner!) anyway. Which left me finishing minutes before 9:00pm after just over six hours on the hoof for an average speed of 3.1 mph… which might not sound fast at all to the road runner but, as any hill runner can tell you, it’s not mileage but ascent that takes the time. And, with Naismith’s rule suggesting more like 11½ hours for this expedition, I’m really quite satisfied with six (hence the ‘slowly quick’) for terrain where steep ascents and awkward rocky descents are frequently demanding slower speeds yet. So how about the Elite 2V Plus, and how did that do? Well, the moment I opened the package, I knew that it was quite simply one of the best-designed bits of kit I’ve ever bought. It’s comfortable, stable when running loaded up and just really well thought out with everything (bottles, front pouches etc.) so accessible and clever details like the tuck-back ends to the waist strap. While true (as you’ll see if you go searching for reviews) that some slimmer folk might find the bottles well-placed for elbow-bashing, I must say that I neither run with my elbows glued to my sides nor swing them that much at the kinds of speeds I’m normally doing, so didn’t find this a problem on yesterday’s pretty rigorous testing ground. And the bottles are so accessible in those angled holders that I’d suggest the occasional nudge is a small price to pay so long as it’s not happening all the time. (Might be worth pointing out here that, with 500ml Lucozade Sport bottles dropping easily into the holders made for Nathan’s 650ml bottles, I’m thinking of trying these on the run and keeping the originals for water only. Also that the rear pouch featured on the 2V Plus but not the 2V is most definitely worth having, comfortably takes a large Montane Featherlite Smock in its ‘ball’ and will swallow up the pants as well if both stuffed in loose.) To summarise, while I don’t recall being aware of Nathan before researching bottle belts the other day, I’ve already seen and experienced enough (can’t believe I’ve managed without this for so long!) to believe their kit is amongst the very best for what it does. 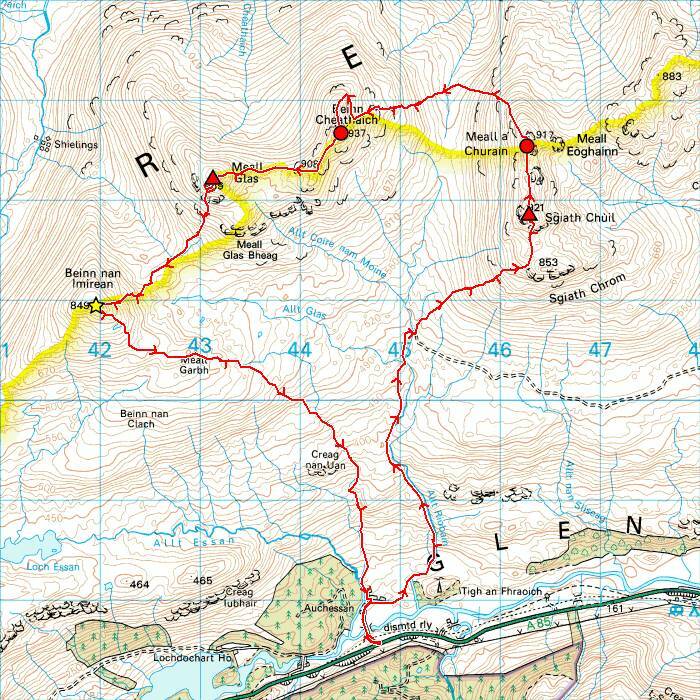 And, secondly, to Tracey and friends (on the slim chance that you see this, find it or someone points you here), another belated apology for selfishly abandoning you all to bag Ben Cruachan itself when you’d had enough after Stob Diamh or Drochaid Ghlas in November 2000 (?). I shouldn’t have done that then, and wouldn’t do it now. 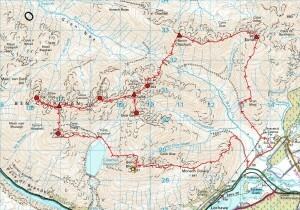 20.4 miles and 4,100 ft of ascent (from Memory-Map as opposed to 310XT’s raw 5,093 ft or Garmin Connect’s incorrectly ‘corrected’ 3,352 ft) to bring my total since Monday to 82.4 miles and 19,400 ft. And that first 6.5 miles or so up to the little dam below the break in the forest would be a fast and easy cycle (had considered taking the bike, but really did want all the running miles I was going to get up Glen Fyne) if actually planning to go the long way another time. Sometimes these things are just so unexpected but, with Fly still out of the water needing work and Twig Olsen lined up to help get her sorted for 2011 (when I’m not going to be training obsessively for running ultras! 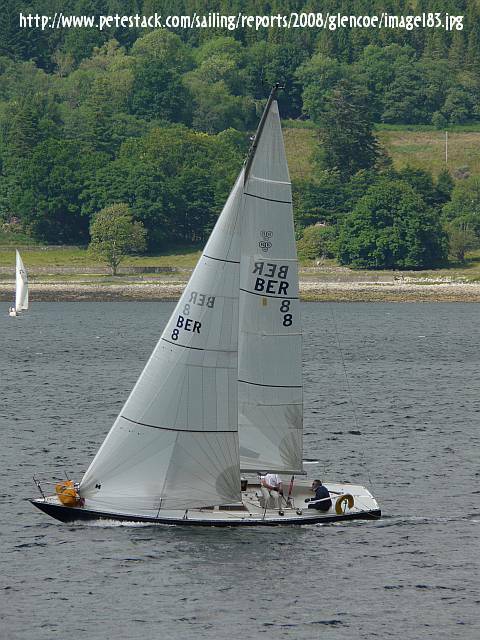 ), I was taken aback to get a phone call last night from a short-crewed Peter Watt inviting me to join Vaila for Glencoe Boat Club’s first race of the season tonight. So I thought aloud for about ten seconds (‘can’t afford to miss a night’s training… need to get out for a run straight after school… yes I’d like to come!’) before agreeing, then kicked myself out of the house for a quick blast up to the Penstock and back (4.6 miles/c.1,200 ft ascent) almost as soon as I got home this afternoon. 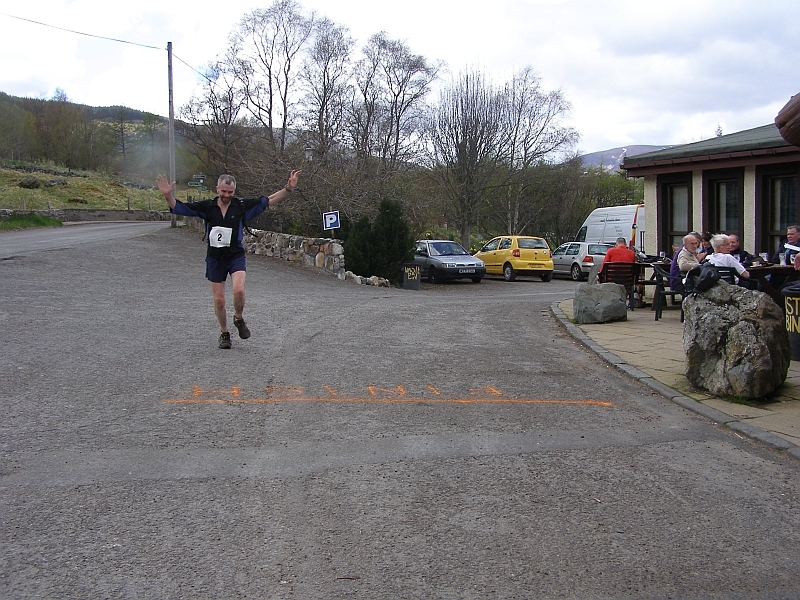 It’s a year to the day since my post announcing my withdrawal from the 2009 West Highland Way Race, but it’s not last year now! 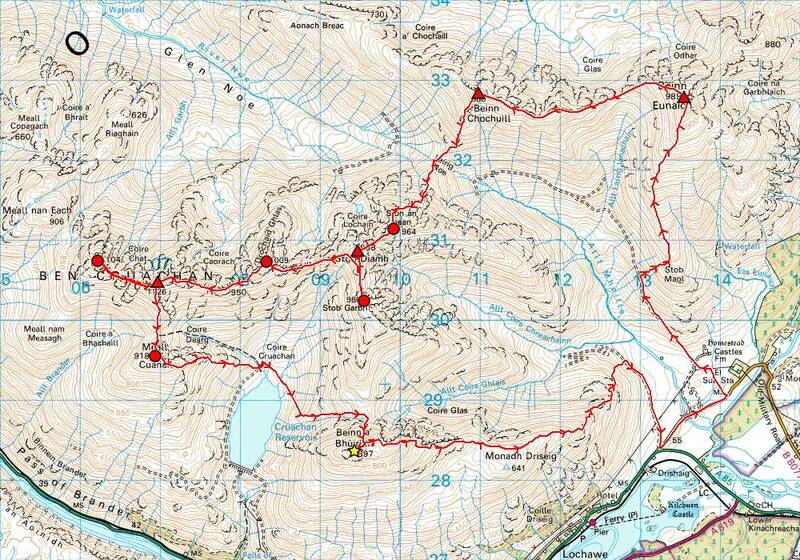 From December 2008’s write-off to December 2009’s icy trail runs… from spring 2009’s sporadic, ‘pretend’ training to spring 2010’s solid, committed build-up… everything’s quite simply different. Last year the fire just wasn’t there (never really got lit and couldn’t be fed), but this year it’s raging and it’s now or never for that coveted PB because I never want to have to work so obsessively at this again! Thought a proper hill run sounded like a good start to this week, so headed out into the Mamores today with the intention of running Sgurr a’ Mhaim, Stob Ban and Mullach nan Coirean, but conditions were so glorious when I got up there that I just had to take a wee diversion up Am Bodach as well! And the hills just seemed so easy (felt almost like I was floating upwards… to match that paraglider soaring above Sgurr a’ Mhaim? ), the Wave Harriers continued to perform impressively enough (got the lacing sorted last night) to have me at the point of ordering a second pair (observant followers of this blog may have noted my predilection for buying running shoes two pairs at a time!) and it was all basically just a magic afternoon out. Although it was a mistake to let curiosity tempt me up the wrong (quickly extinct) path leaving the main Mamore track and I’d have to advise anyone taking that otherwise excellent route up to the ridge to hang on (as I knew I should have done) for the path beyond the bridge. Also have to make another observation about the ‘Elevation Corrections’ applied to raw GPS data by Garmin Connect, which is to suggest that my suspicions (discussed in my post of 1 April) about their elevation data containing too few points of reference appear to be founded when the ‘corrected’ data for today’s track gives my max elevation as 3,520 ft and I know that Sgurr a’ Mhaim is 3,601 ft high! So my preferred method of cross-checking the recorded ascent/descent is now converting the track to a route (ignoring the shorter distance usually resulting from more straight lines) in Memory-Map and getting it from the route properties, which gives 7,051 ft of ascent and descent (compared to the Forerunner’s 7,150 ft up/7,135 ft down and Garmin Connect’s ‘corrected’ 6,294 ft) for today’s 17.3 mile trip. One more thing I might mention before hitting that ‘Publish’ button to get this thing online is that I’ve been looking over my 2007 diary to see how this year’s WHW build-up compares, and noted that it was roughly mid-to-late May that year that I started to suffer from the knee problems that continued to plague me for months after the race. So naturally hoping (as I’ve believed for some time) that the magic insoles have got talismanic qualities there and, while it’s clearly not last year now, it’s not 2007 either!